Yeah, you're reading that right. 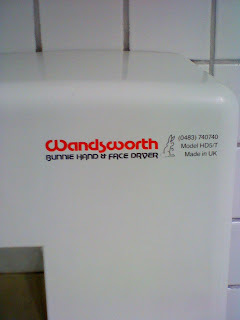 That is an official Bunnie Hand & Face Dryer. Not only does it dispense of what could, at best, be described as a pleasant breeze, it has the word 'Bunnie' in the title. Drying your hands with the bunnie dryer is about the most emasculating thing on the planet. I HATE those things! You might as well just run around with your hands flailing around, because they would probably get dry faster than holding them under that thing. I'd rather dry my hands off on a bunny. Whenever I see hand dryers I think of Opportunity Knocks. Don't you just want one of the "blower things?"